It’s back in the 40’s here in Ithaca (darn you Mother Nature! ), but I’m protesting the cold weather and making spring-ish desserts. 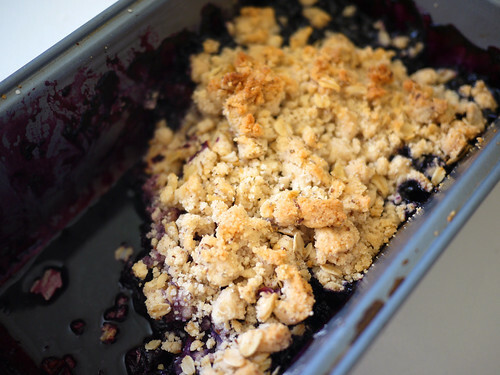 Using this simple, easy recipe from Ruth Reichl on GiltTaste, I was able to pull a bubbling, heavenly-smelling blueberry crisp out of the oven within an hour with minimal mess and effort. 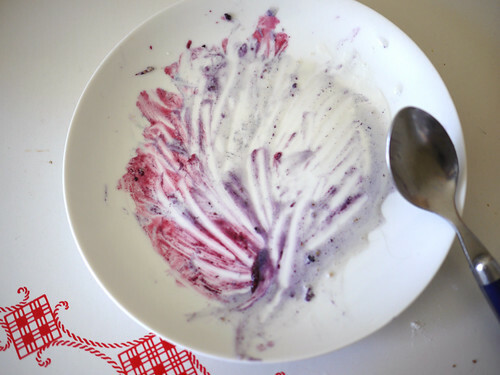 I only had regular frozen blueberries, which I defrosted and drained before using for the crisp. 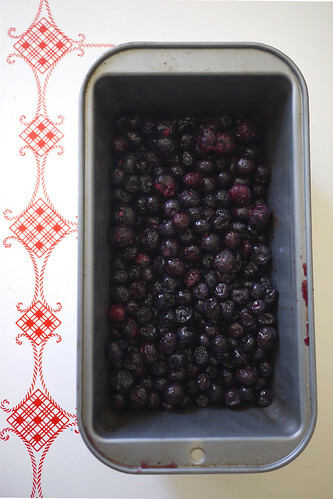 Other small modifications: mixing the blueberries with a teaspoon of cornstarch to better soak up and thicken the juices, adding a few drops of good vanilla extract to the topping, along with a handful of old-fashioned oats and flaxmeal. This recipe would probably work equally well with strawberries, raspberries, even apples. It’s a great dessert to pull together when you’re in a tight spot, since you’re bound to have most of the ingredients in your pantry already. Slivered almonds would be an awesome addition as well. Good vanilla ice cream with this dessert is a must. I can’t wait to eat leftovers tomorrow for breakfast. Preheat the oven at 375. Combine melted butter and sugar, and stir in the sugar. Add salt and cinnamon and mix. Slowly incorporate the flour, until you have a dry and crumbly mixture. Mix in oats and flaxmeal if using. Pour the mixed cornstarch and blueberries into a well-buttered pie plate (I actually used a loaf pan) and sprinkle the crisp topping over the blueberries. Use all of it, even if it seems a little excessive. This topping is that good. Bake for 45 minutes or until the topping is nice and golden. Serve with a scoop of vanilla ice cream. 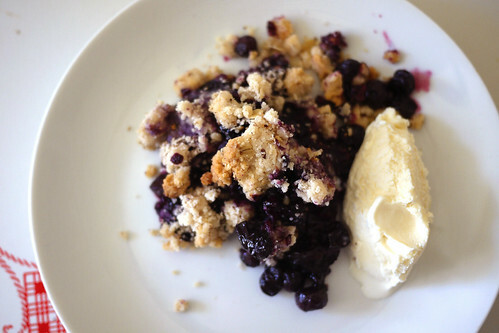 You are currently reading Ruth Reichl’s blueberry crisp at Notes on Food.